While checking out the Kala Ukulele Bundle (further down this page), Amazon.com was busy placing a cookie on my browser so it could email me suggestions for things I might be interested in based on my past searches... which is how I came to find out about this bundle. At first, I rolled my eyes becuase of course, I'm a little creeped out by the way sites like Amazon and other online stores learn your shopping preferences and try to sell you merchandise based on your history. But then, I saw the price and decided to look at this bundle out of curiousity. The first thing I noticed was that there were over 600 reviews and the majority very favorable. And truth be told, I've bought very inexpensive ukes in the past and as amatter of fact, my little soprano Ariana is a cheap little uke that I bought about 10 years ago and it still plays and sounds pretty darn good! So I have no problem recommmending this little starter pack. Remember, if Alfred's lessons aren't enough by themselves, you can always learn to play songs on your ukulele on Youtube. Hey, for 35 bucks, you can hardly go wrong. I won't go into any more detail other than to say that, once on the page, read some of the 4 and 5 star reviews. I would suggest however to ignore the negative reviews. when 75% of the opinions from 670 customers are 3, 4 and 5 stars, I tend to give this pack my seal of approval. So click on my "Hal's Seal of Approval" and enjoy learning to play the ukulele with Alfred! Ever since I started playing the ukulele, I wanted to turn EVERYBODY onto playing the ukulele. Why? Because it's SO darn easy to learn. I'm not saying it's easy to master, but you can have a world of fun playing one right from the get-go! There are so many beautiful ukuleles out there and of course the best ones come from Hawaii. They rang in price from about $20 up to $1000 and beyond. But you really can get started with a very inexpensive uke and explore other options later. SO - with that in mind, my first offering is the Kala MK-S Soprano Ukulele. You probably know somebody who has one lying around the house that they pick up from time to time just to noodle around with. If you want to learn to play your favorite song, you needn't go any farther than Youtube for an online ukulele lesson. I'd suggest doing a search for Ukulele Mike. He's a great teacher and easy to follow along. I'll go into more depth about ukulele resources soon. 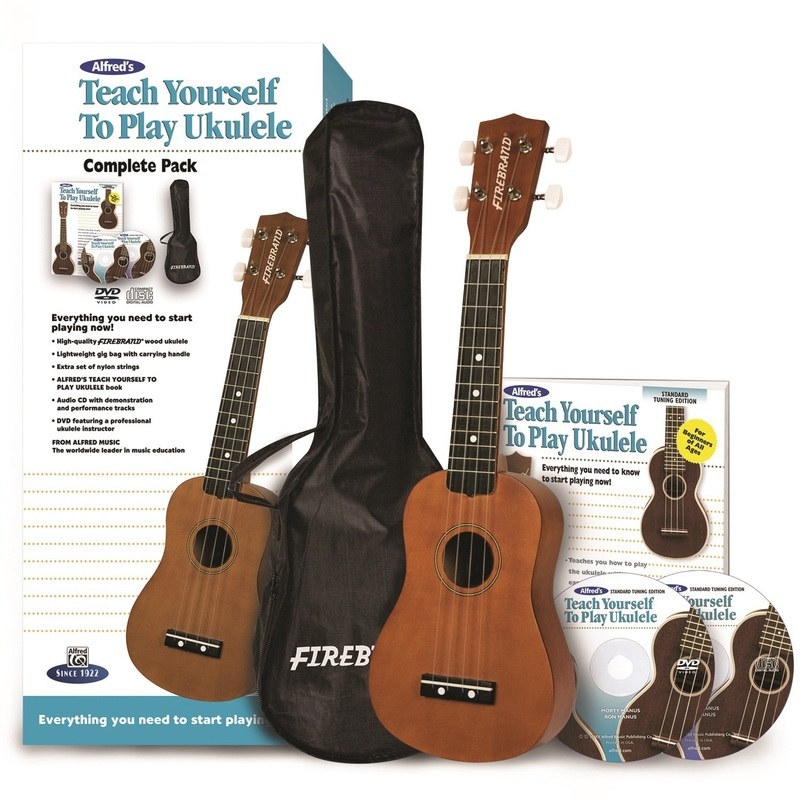 If you want a terrific beginner package for yourself or one of the musically inclined kids in your house, get this bundle today!